OHHHH MY GOSH YOU GUYS. I have been dying to tell you about it since I had it last weekend. I even had something else lined up for today but, it can wait. You need to make this cake. Drop everything. My sister Caitlin was in town last weekend to celebrate her birthday. She’s a big fan of vanilla cake and I started brainstorming something cool for her. When I checked out the Momofuku Milk Bar cookbook from the library recently, I happened again on this showstopper and I knew it was time. For those of you who aren’t familiar, Momofuku Milk Bar is a well-loved dessert bar in New York (with a new location in Toronto!) known for the cakes, cookies, pies and other treats created by their co-founder Christina Tosi. In reading the Milk Bar cookbook, I’ve developed a huge admiration for her. The book is stellar in every way and she is a creative genius in the kitchen, in my opinion. I fell in love with this cookbook so much that I plan on buying a copy and bombarding you with every recipe in it. You don’t mind, do you? 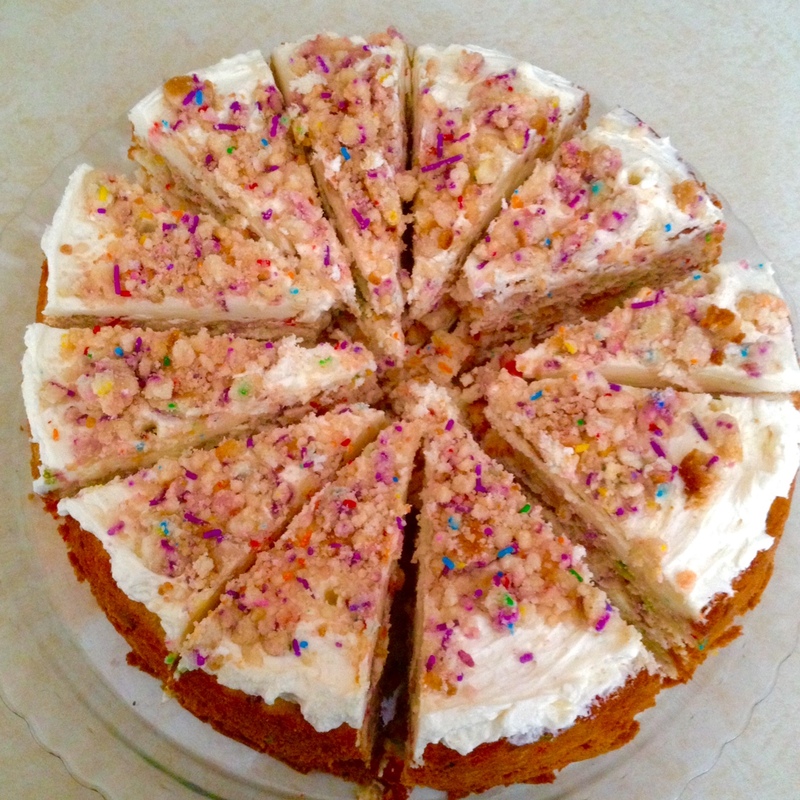 I had lusted over Milk Bar’s Birthday Cake for ages now, but I was admittedly a little intimidated by the process. It just looked so complicated, with a lot of ingredients and materials that were hard to come by. Once I read the cookbook though, complete with suggestions for substituting the hard to find ingredients, I was on board. In the original method, you bake the cake in a quarter sheet pan and then cut out three 6 inch circles for the cake layers. Then, you layer the cakes using a cake ring and strips of acetate. I decided to really simplify things and bake two cake layers in 9 inch round pans. This way I didn’t have to buy acetate, a cake ring and a new sheet pan. I figured if I bought all that, I might as well just fly to New York and pick up a damn cake myself. I’m exaggerating a bit, but still. Resourcefulness for the win! I’m kind of embarrassed at how much I avoided this recipe because it was actually really simple and fun to put together. I made it all in one go, but you could even make the crumbs and cake one day and assemble it the next. I made the crumbs first and while they cooled, made the cake. Then while the cake cooled, I stirred together the soak and made the frosting. By the time that was done the cakes and crumbs were cooled for me to assemble the whole thing, which took me maybe ten minutes. I love how rustic and unique this cake looks. And the taste? We were dying, DYING over this cake. I’ve made many, many cakes in my day, and this one is my favorite ever, bar none. My fellow taste testers agreed. All we could talk about while we went about our weekend and even while we ate dinner at a fancy Italian restaurant was that we couldn’t wait to get back to the house for another slice of this cake. It’s a winner, you guys, and now that I’ve figured how to make it even easier, I’m passing my suggestions onto you. DO IT. Preheat the oven to 300 degrees. Combine the sugars, flour, baking powder, salt, and sprinkles in the bowl of a stand mixer fitted with the paddle attachment and mix on low speed until well combined. Add the oil and vanilla and stir again, until everything mixes together and forms small clusters. Bake for 15-20 minutes, tossing halfway through. Remove from the oven once starting to turn light gold. Let the crumbs cool completely before using in a recipe. While your crumbs cool, bake your cake. Preheat the oven to 350 degrees. Grease and flour two 9 inch round cake pans, then line the bottoms with parchment and set aside. Combine the butter, shortening, and sugars in the bowl of a stand mixer fitted with the paddle attachment and cream together on medium-high for 2 to 3 minutes. Scrape down the sides of the bowl, add the eggs, and mix on medium-high for 2 to 3 minutes. Scrape down the sides of the bowl once more. On low speed, pour in the buttermilk, oil, and vanilla. Increase the mixer speed to medium-high and beat for 4 to 6 minutes, until the mixture is practically white and twice the size. Don’t rush the process; there should be no streaks of fat or liquid. Stop the mixer and scrape down the sides of the bowl. On very low speed, add the cake flour, baking powder, salt, and the ¼ cup rainbow sprinkles. Mix for less than a minute, just until your batter comes together. Pour the batter evenly between the two prepared pans. Sprinkle the remaining 2 tbsp. of rainbow sprinkles evenly on top of the batter. Bake the cakes for 30 to 35 minutes. At 30 minutes, gently poke the edge of the cakes with your finger: the cake should bounce back slightly and the center should no longer be jiggly. Leave them in for a few extra minutes if need be. Once they are finished baking, take the cakes out of the oven and cool on a wire rack. While the cakes cool, make your soak and frosting. Stir together the milk and vanilla in a small bowl. Set aside. Lay one layer of the cake down on a plate. Using a silicone basting brush, soak the first cake layer evenly with half the soak. Spread it with half the frosting, and then sprinkle it with the crumbs. Lay the second cake layer on top. Brush it with the remaining soak, spread it with the remaining frosting and garnish with more crumbs. Freeze the cake for at least a few hours or overnight, thawing before serving. 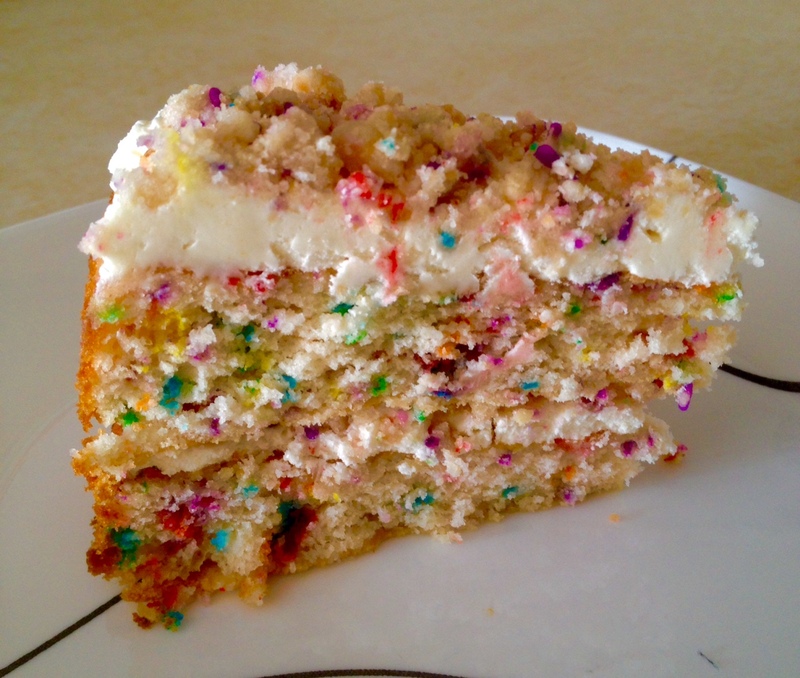 Christina Tosi recommends McCormick’s clear vanilla extract for this cake because it tastes more like boxed cake mix, but I couldn’t find it and gave up after three stores. I used clear vanilla extract that I picked up in Mexico and it worked great. As you may notice, I made a few substitutions in my version of the cake, because again, some of the original ingredients were hard to find. For the frosting, I couldn’t find citric acid or glucose. I left the citric acid out entirely and I substituted half the amount of corn syrup for the glucose. I also used canola oil instead of grapeseed oil as recommended in the cookbook by Christina Tosi. The crumb recipe is SO GOOD. My Main Taste Tester said it tasted just like crumbled Rainbow Chips Ahoy, and he’s right. It almost killed to me not eat it all before getting it into the cake. The recipe makes a lot of crumbs. I felt like I layered them on my cake pretty thick and still had a good amount left over, which I froze. If you don’t want extra, you could cut the crumb recipe in half. Or, if you’re smart, you could save the extras like I did and put them on everything. Confetti cookie crumb ice cream sundae, anyone? These were so good I’ll probably remake them on their own. sounds great ..did you try bulk barn of michaels for the hard to find things ? I did! Michael’s was just sold out of the glucose but I couldn’t wait. It’s still an awesome cake without it though! Hi! Hoping to make this today for my daughter’s birthday tomorrow! Do you freeze the cake all assembled? What do you cover it in? How long should it take to thaw? Hi! Yes, you freeze the cake totally assembled. I just put it in a plastic cake carrier and freeze it right in that. Or you can set it on the lid of a big Tupperware bowl and place the bowl over top. In the past, I’ve moved it to a fancier cake stand frozen and let it thaw on that, still covered. I always froze it overnight so I would probably take it out several hours before serving, but even more if you can swing it, maybe the morning of the party? I find this cake gets more moist the longer it can sit after thawing. I hope that helps! This is an awesome birthday cake. Honestly I think if you just refrigerated overnight it would be fine! Let me know how it goes! The cake turned out great! Super yummy. It was a big hit. I ended up making room for it in my freezer too. I’d attach a picture if I could, thanks for your help!